Distracted Drivers is a program designed to teach student drivers about the dangers of distracted driving and the precautions they should take while driving. Each day, more than fifteen people are killed and more than 1,200 people are injured from crashes related to distracted driving. Distracted Drivers was created by the U.S. Department of Transportation 5 years ago in an effort to raise awareness of the dangers drivers can experience on the road. Memorial Regional Hospital, BSO, and AT&T are also affiliated with the program. Professional NASCAR driver Gabby Chaves is also a spokesperson for Distracted Drivers in Broward County. Chaves knows how hard it is to manage a car and the dangers it poses. He has become an important role in the Distracted Drivers Program and is determined to influence young drivers to make the right choice. Many accidents would be prevented if students put their phones down, lowered their radios, and limited the amount of people in their cars. 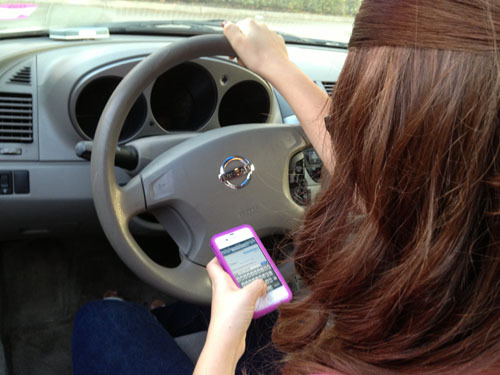 Text messaging creates a crash risk 23 times worse than driving without any distractions. Moreover, driving 40 mph and glancing at a text for just 5 seconds is equivalent to driving blind over the length of a football field. In 2010 alone, 3092 people were killed in crashes involving distracted driving and an estimated 416,000 were injured in motor vehicle crashes involving a distracted driver. Another way Distracted Drivers helps spread the word is by an outreach program called Prom Promise. Representatives from Distracted Drivers come to schools and put on live performances with staff members and peers from schools. They reenact the night of prom and several of the possible things that go on, such as drinking. It is very visual and allows students to see the effects of what would happen if students choose to get behind the wheel while intoxicated. Prom Promise hopes that the performance will make students change their mind about their choices and to be wise. When it comes to driving, knowledge and awareness are extremely important. Distracted Drivers is present to help people along this path and may sure that when they get behind the wheel, they are not distracted.